Many a sentiment has been attached to the color pink. Far beyond its stereotype as a “girly” color, pink has deep connotations: health, joy, and gratitude; gentleness, grace, and gladness. And what higher emotion is expressed by the color pink than happiness? Maybe that’s why so many brides-to-be are choosing pink-hued gemstones for their engagement rings. And when paired with rose gold, there’s no finer match that expresses your happiness and joy than a rose gold morganite engagement ring. On Dec 6, 1910, The New York Times ran a story about a remarkable new gemstone that was discovered on a mountainous island near Madagascar, a small island nation off the southeastern coast of Africa. The gemstone, bearing a distinctive pink hue, was a variety of the mineral beryl. But the newly discovered gem had a color unlike any other: like a “true pink rose” and “unique for a pink gem of any kind, from any locality,” as the chairman of the geological section of the American Academy of Sciences breathlessly described it. Henceforth, this exotic gem would be known as morganite, named in honor of the Academy’s most ardent benefactor, the financier and gemstone enthusiast J.P. Morgan. That morganite has been known to the world for just a little over a hundred years makes this gemstone somewhat of a newby to the more well-known beryl varieties like emeralds, which date back to ancient Egypt, and the aquamarine, which was discovered in Siberia in the late 18th century. After its discovery in Madagascar, morganite was also found in Brazil, which eventually became the top producer of the gem and is still the source for most of the morganite on the market today. Small quantities have also been found in Afghanistan, southern Africa, and even in the US. For that reason, morganite can be cut in larger sizes and lends itself well to all shapes. What’s your favorite shape? Learn about the eight basic shapes of gemstones. Morganite’s hardness — 7 on the Mohs scale — is lower than other gemstones and even its beryl relatives (emeralds and aquamarines range from 7.5 to 8 in hardness). Yet its durability is not much different than harder gems (such as sapphire, at 9 on the Mohs scale) and can stand up to daily wear and tear with the appropriate care. Learn how to care for and maintain the beauty of your precious gems with our handy DIY tips. Like all of the gemstones we sell at Love & Promise Jewelers, you can rest assured that every morganite in our collection has been ethically sourced, fairly traded, and guaranteed to be 100% conflict free. Learn more about conflict-free gemstones. 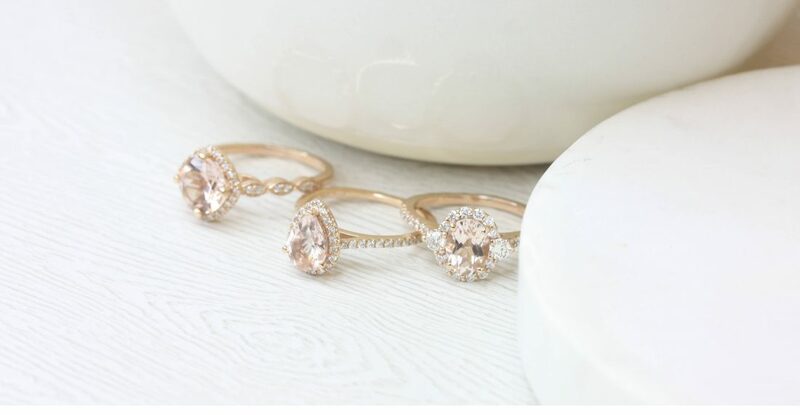 See more of our morganite and rose gold engagement rings and wedding sets, worn by real-life fiancées and brides, on our Rosados Box Instagram page.